As with all things, that which is made can be unmade by the simple ebb of time and space. Fire and water, steel and the force which ties them together share a ubiquitous relationship especially to the smith, and despite the countless times they face those things prediction is still impossible. A well hammered billet or a cold formed sheet, a drawn wire or a rolled bar, it does not matter, for every piece of steel has its own face and its own spirit. Some will be forged, others broken, but it is that transformation that keeps us coming home to face it again and again. Before the first embers, the idle thoughts of creation stir design. Inspired by history or myth, fancy or those curious creations of others, they meet together and form anew. Page upon page lay half forgotten or half finished, and with them all may come their time of reckoning where they either are breathed new life or discarded once again. 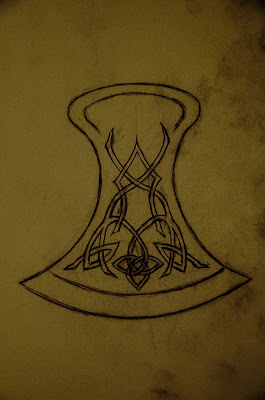 Many months ago, I began to sketch a design for an Ulu, meaning 'woman's knife', that comes from the beautiful lands of the Alaskan natives. This knife is the Inuit equivalent of the Germanic seax, and was used for everything from skinning animals to building their homes. While the traditional ulu differs greatly from my design, its foundation remains true in spirit. Meant to be held with the top in the palm of the hand, it will be about 10cm long. Of course, the Inuit blades did not have such patterns engraved into them, and that is in part where I diverge. The steel for this particular project comes from a bar of 1084, the widest I had on hand, although it is still too narrow for the dimensions of the cutting edge. As my skill and experience develops, I learn new techniques and greater control over the red hot metal. To begin, I kept the stock at length and began the flaring of the end with the hammer's peen. To the non-metal workers, peens are that useless end of the hammer that cannot pull out bent nails. To some smiths, it may be just as foreign. Indeed, it was to me until a relatively short time ago when I stubbornly used only the flat (slightly crowned) face to do everything. Until now. The peen is a device by which the force of a hammer's blow is transmitted in only two directions instead of three. Of course, the downward deformation is impossible to avoid if any lateral change is desired, so that is the first. The other is the manner in which it is pushed out. A flat face moves the steel out in width and length, shortening thickness. Straight/cross/skew peens will move it only in width or length, depending on how it lands. 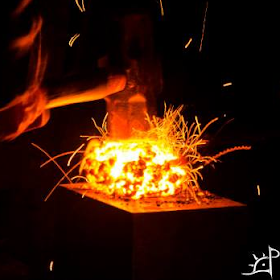 One cycle through the fires of creation, and the unmoulded steel begins to slowly transform into its destined shape. Little elongation accompanies the flaring at the end, and a fanlike hammering pattern brings the two corners farther apart while keeping the neck thin. To keep the steel from becoming too thin, I upset the edge by heating it alone to a malleable orange. Steady, careful repetition of peening and upsetting brings the corners still farther apart. The length of the piece is longer than the final ulu will be, as that needed material will be pushed into the edge and shoulder. In order to prevent working myself into an unsavoury situation, I must also work the back end of the ulu before the cutting edge becomes too thin to hammer against. That, and as the edge takes form, it also becomes rounded. Using that edge as a brace on the anvil as I upset the opposite end will flatten it, which is one more wasted heat to correct. Instead of keeping the palm end flat and narrow like the cutting edge, I leave it slightly mushroomed to make it more comfortable to hold during use. 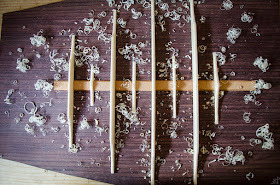 The neck, however, must be kept flat and taper evenly from the edge to the handle. In traditional ulus, a piece of flat metal would join with a handle of bone, wood, or stone. Here, it is an integral blade pertly due to convenience, and partially for the practice and care of forging. Steadily working both ends, the girth begins to widen from the continued hammering on the ends. Compared to the original stock, the flat is nearly half a centimetre wider and proportionately thicker. Despite the flaring in the end, many of the marks from peening remain. Fortunately, there is still enough thickness remaining to hammer with the flat end to smooth and flatten it. Due to excessive use of the peen and little experience with the technique, the corners have opened a little too far compared to the transitional radius needed between body and edge. Fortunately, a combination of the anvil's horn and half round files, such problems are trivial. Cleaning the edges was a fairly simple and painless procedure. After fixing proportions and evening the curvature on the horn, I turned to the files to refine the lines and put a slight radius on them for heat treatment. A quick and dirty attack on the scale and comparison to the original shows that the shape is slightly different, but for the size of the stock, pushing it farther would be needless. A usual heat treatment brought the blade up to non magnetic . From the forge edge quenched into warm canola oil, as the body must be soft for engraving, and then into the oven at 385 for three cycles left the edge hard and straight. And cracked. This is not the first, nor will it be the last blade lost to heat treatment, but it is those subtle cracks that do not stop your heart with a ping as glowing steel plunges into the quench that hurt the most. It is as though the steel would rather have been something else, and sacrifices itself just when you thought it was safe to breathe again. Because the crack is deep and runs through the better part of half its width, I will not finish it as I originally intended. It now holds as fine an edge as my worn down 320# belt can grind and sits in the kitchen against the knife block hoping for use in that odd job. Perhaps this is a sign that I should do this again and take better care to keep the steel whole. In the end, I learned from the process, from my mistakes, and that it is the journey that makes this craft worth practising.